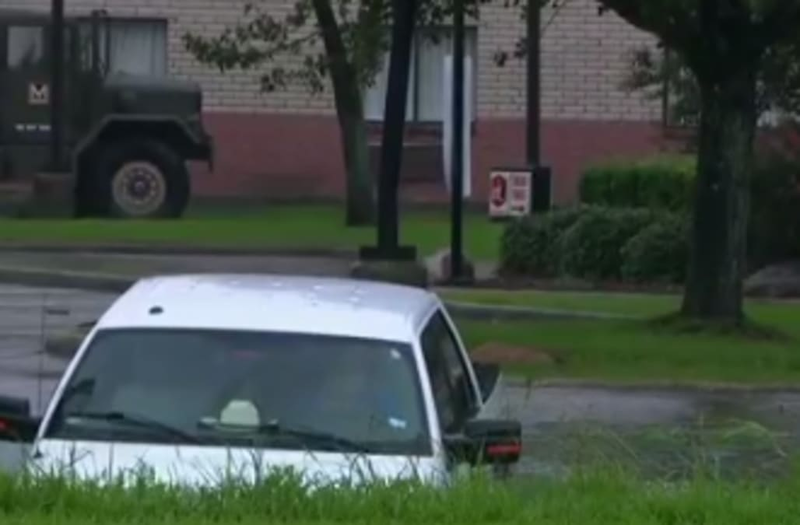 A CNN crew rescued a man who accidentally drove his truck into a flooded ditch in Beaumont, Texas, on Wednesday. "We just literally just rescued this guy out," correspondent Drew Griffin said on-camera after the dramatic rescue. "This man just accidentally drove into a ravine that looked like a road." "And his truck just went in and it's now going down that ravine," he said. "It happens within seconds." Griffin was reporting on Hurricane Harvey in the southeastern Texas town 85 miles west of Houston, when the crew spotted a white pickup truck enter what looked like a street covered in water, but was actually a flooded drainage ditch. Griffin called out to the driver as the truck began to float away. Using a rope they had on hand, the crew members were able to pull the man out from the vehicle and bring him to dry land. "There was no time to call 911," Griffin said, adding that "there was no way they were going to get here in time." A gauge near Beaumont recorded over 26 inches of rain on Tuesday alone, and the area has received nearly 46 inches total since Thursday, according to the National Weather Service. The man, Jerry Sumrall of Winnie, Texas, was shaken, but in good spirits after the rescue. "I want to thank these guys for saving my life," he said. Griffin estimated the ravine was flooded with 12 t0 20 feet of water. According to NOAA, 12 inches of fast-moving water can carry away a small car, and 6 inches of fast-moving water can knock over an adult. He wrapped up the news segment with a warning to other local residents thinking about getting on the road. "This is why they don't want you out, they don't want you driving around. You can't tell the difference between a road, a ravine, a creek, a culvert that's just overflowing," Griffin said. "This is a very, very dangerous situation."